World Tourism: Golf: Watch The Ball! This phrase is often repeated in nearly every sport – keep your eye on the ball. It applies to golf too! If you do not watch the ball, then the chance that you will hit it is very slim! Keep your eyes focused on one part of the ball. Don’t watch your club as you swing. Keep your focus on the ball and let everything else fade into the background. Try to look down on the ball, rather than watching it at the end of the golf club. Raising your shoulders is not going to help you see the ball more clearly. If you will look down on the ball, you will get results that are more successful and you will not have a tendency to look up before the end of your swing. Unfortunately, it is completely natural to look away when you begin to pull the club back. Ignore the natural feeling and keep your eyes on the ball. When you are looking down at the ball, you should notice that the only way you can keep the club head in the correct line of flight is to keep your hands moving parallel to the flight line. Keep your hands in line with the club head when making contact with the ball. It is very important to learn to watch the ball no matter what kind of shot you need to make. It does not matter if the ball is in the long grass, the sand trap, on a slope, or anywhere else, the main thing is to see the ball completely so that you can hit it solidly and successfully. There are not many golfers who stand still and keep their attention on the ball. Many times, people will look at where they want the ball to go and then look at the ball. Most golfers would be surprised to learn that they do not stand still and watch the ball. The instant that you take your eye off the ball, you begin having problems. 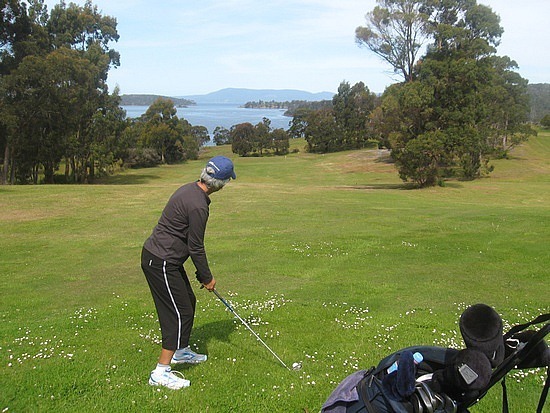 Most golf mistakes are a result of a loss of concentration. It you keep your focus on the ball, you will be able to hit the ball well. To help your golf game, remind yourself to keep your eye on the ball for the entire swing. You will find your golf game improving so much that your friends may be asking you for advice!